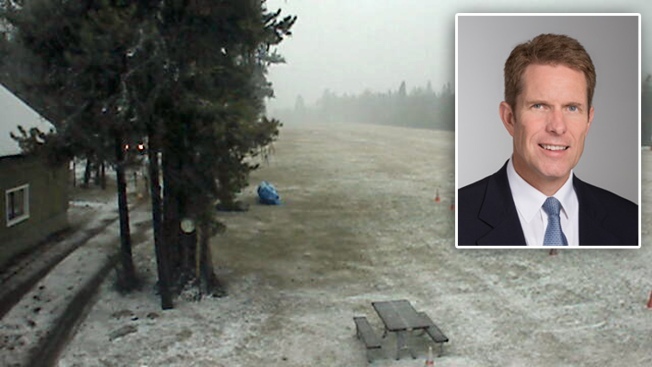 Rescuers are searching for a small aircraft owned by a Silicon Valley executive that has been reported missing in the wilderness near the central Idaho town of Yellow Pine. Officials say the pilot of the single-engine plane with five people aboard reported an engine failure near the Johnson Creek Airstrip, about 125 miles northeast of Boise, around 3:30 p.m. Sunday, NBC affiliate KTVB reports. Valley County Sheriff Lt. Dan Smith said the people on board are from the same family. The Salt Lake Tribune reported that passengers included Amber Smith of San Jose, and her fiance Jonathan Norton. Norton's uncle, Alan Dayton, told the paper that his nephew was traveling with the Smith family after Thanksgiving vacation, and had traveled from San Jose to Baker City, Ore.. They were heading to Butte, Montana, to drop off Smith's brother and sister-in-law, when the pilot lost contact with air traffic controllers in Salt Lake City. The BE-36 Beech Bonanza is registered to Dale Smith, of San Jose, according to FAA records. Authorities wouldn’t specifically confirm Dale Smith was flying the plane, but did say the pilot was the owner of the plane. Eric Peterson, assistant director of the Santa Clara County airports, confirmed that the plane and its owner, Dale Smith, are tenants at Reid-Hillview Airport in San Jose. Rand Kriech, who co-founded the hardware and software company SerialTek with Smith, called his friend an excellent pilot after flying with him several times. "He's one of the safest pilots I know. A very cautious pilot," Kriech said on Monday night. "Have no fear of flying with him at all. I'm a pilot myself and I really appreciate somebody that takes as much care as Dale." Those close with the Smiths said the family had spent Thanksgiving in Oregon, and that Dale was flying one of his sons to Montana. Investigators said the people onboard the missing plane are from the Smith family. "I would be very worried if they haven't heard from him," said Linda Castillo, a neighbor. "Because he stays in touch. You know when he goes on these trips, he stays in touch with everybody." Elizabeth Neipp is hoping and praying for her friend, Smith, and his family are safe. "Dale is smart. He's talented. He is good at what he does," she said. "So there's good reason to think, to hope that there is a happy ending to this." Track vehicles, ATVs and snowmobiles were mobilized for a ground search. The Valley County Sheriff's Department is coordinating the search effort, which includes deputies, EMS, firefighters, search and rescue crews. A Lakota helicopter with the Army Air National Guard left Gowen Field in Boise around 10:30 a.m. Monday, but was forced to turn back because of poor weather conditions. Blackhawk helicopters in McCall will fly to Johnson Creek when weather permits. The Civil Air Patrol and fixed-wing planes from the Idaho Transportation Department also plan to join the search when the weather allows for a safe launch. The search was called off for the night early Monday evening due to heavy snow and low visibility, and resumed at daybreak on Tuesday. Smith obtained his pilot's license in 2005 and had a second-class medical certification, allowing him to operate commercial aircraft, the Associated Press reports.